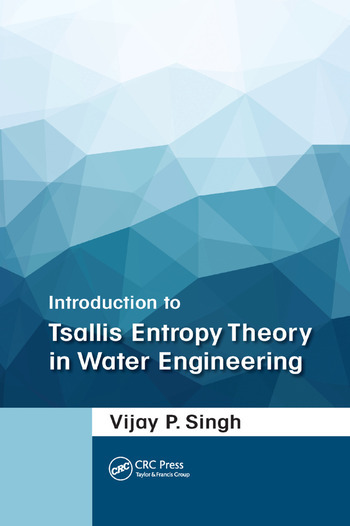 A broad treatment of the Tsallis entropy theory presented from a water resources engineering point of view, Introduction to Tsallis Entropy Theory in Water Engineering fills a growing need for material on this theory and its relevant applications in the area of water engineering. This self-contained text includes several solved examples, and requires only a basic knowledge of mathematics and probability theory. Divided into four parts, the book begins with a detailed discussion of Tsallis entropy, moves on to hydraulics, expounds on the subject of hydrology, and ends with broad coverage on a wide variety of areas in water engineering. Introduction to Tsallis Entropy Theory in Water Engineering examines the basic concepts of the Tsallis entropy theory, and considers its current applications and potential for future use. This book advances further research on water engineering, hydrologic sciences, environmental sciences, and water resources engineering as they relate to the Tsallis entropy theory. Vijay P. Singh is a distinguished professor in the Department of Biological and Agricultural Engineering as well as the Zachry Department of Civil Engineering at Texas A&M University. He received his B.S., M.S., Ph.D., and D.Sc. degrees in engineering. He specializes in surface-water hydrology, groundwater hydrology, hydraulics, irrigation engineering, environmental quality, and water resources. Dr. Singh has published more than 24 textbooks. He is a registered professional engineer, a registered professional hydrologist, and an honorary diplomat in water resources engineering of the American Academy of Water Resources Engineers. "… a comprehensive introduction to hydrologic processes from the entropy perspective." "Dr. Singh does an excellent job of combining the Tsallis entropy theory with water engineering for water flow and transport of sediment in hydraulics. I greatly admire the approach—the details and the rigor presented in this book. I would definitely have this on my bookshelf." "The book is organized well. … The topics covered are relevant, and more importantly, come with examples. … The main strength of the book is the compilation of Tsallis entropy applications in water resources engineering by one of the foremost researchers in the world on this topic. The style and presentation is within the reach of most graduate students, and should appeal to academics and practitioners." "… Dr. Singh’s book provides an easy-to-digest summary of the fundamentals of using entropy concepts. He illustrates the methods using a broad array of detailed applications. … a primary resource for anyone interested in learning and applying entropy concepts." "… a game changer for research and practice in water resources engineering. … The author has explicitly demonstrated the unifying nature of Tsallis entropy theory in developing solutions to water resources problems. This book will hail a new era for solving problems based [on] Tsallis entropy theory in water resources engineering."